Nahyun Kim composes in a complex yet modern idiom, combining unique pitch sets with engaging rhythmic profiles and a romantic sensibility that blends intuitive explorations, especially when dealing with psychological complications. She enjoys exploring the subject of mental disorders and writing music influenced by a relationship between cognitive science, psychology and the unity created through the musical experience. Through numerous conferences and festivals, her works have gained recognition in Greece, Spain, Ukraine, Italy, China, France, Korea, and throughout the United States. She has also worked with ensembles and soloist such as Redi Llupa, Jonathan Levin, Jonathan Levin, Jessica Nilles, Bera Romairone, Minju Choi, Jenny Lin, MIVOS Quartet, PUBLIQuartet, Ricochet Ensemble, Bruson Quartet, The Sylvanus Ensemble, The American Brass Quintet and among others. In addition, Dr. Kim has won many competitions and received performances such as the 2019 Kaleidoscope MusArt Concert in Miami, the 2018 Abundant Silence New Works Concert in Denver, the 2014 PUBLIQ Access Showcase Concert in New York City, and the 2013 Kiev New Music Festival. As a scholar, she presented, “Development of the Original Korean Musical,” at the Hawaii International Conference on Arts and Humanities. Currently, she teaches music composition, advanced music theory, piano, and keyboard skills at Kansas City Kansas Community College. Also, she is a Distinguished Composer of Choral Music Activities at KCKCC where she has been commissioned to write new works. In recognition of her dedication to teaching, she received the TEACH award (Teaching Excellence And Colleague Honor) for creative, innovative and excellent work in the classroom at KCKCC. Previously, she taught composition at the University of Missouri-Kansas City Conservatory of Music and Dance, and taught music theory at the State University of New York, Stony Brook. As composer-in-residence for Grande Gioia Music in Seoul, Korea, Dr. Kim’s current project is the completion of GUMIHO an Opera in Two Acts. Dr. Kim earned her Bachelor of Arts in Music, and Master of Arts in music theory and composition from Stony Brook University, New York, and a doctorate in composition at the University of Missouri-Kansas City. Her primary teachers include Chen Yi, Zhou Long, James Mobberley, Paul Rudy, and Sheila Silver. In addition, she has participated in master classes and had additional lessons with Dimitri Papageorgiou, Stefano Gervasoni, Ricardo Zohn-Muldoon, Christopher Theofanidis, Dmitri Tymoczko, Mario Garuti, Akira Nishimura, Louis Karchin, Fabien Levy, Stephen Hartke, Alvin Singleton, Christopher Rouse, Claude Baker, Paul Lansky, John Psathas, and Ezra Laderman. 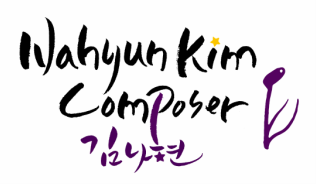 Nahyun Kim composes in a complex yet modern idiom, combining unique pitch sets with engaging rhythmic profiles which blend intuitive explorations, especially when dealing with psychological complications. Through numerous conferences and festivals, her works have won many competitions and have gained recognition in Europe, Asia, and throughout the United States. She has also worked with ensembles and soloist such as Redi Llupa, Jonathan Levin, Bera Romairone, Minju Choi, Jenny Lin, MIVOS Quartet, PUBLIQuartet, Ricochet Ensemble, Bruson Quartet, The Sylvanus Ensemble, The American Brass Quintet. Currently, she teaches at Kansas City Kansas Community College and is a Distinguished Composer of Choral Music Activities at KCKCC. Dr. Kim holds degrees from Stony Brook University (NY) and the University of Missouri-Kansas City. Her primary teachers include Chen Yi, James Mobberley, Zhou Long, and Sheila Silver with additional lessons from Stefano Gervasoni, Christopher Theofanidis, Stephen Hartke, Paul Lansky, Ezra Laderman, and others. Photography by Nayoung Kim from her series, "An Inconspicuous Flowers"